When decorating a backyard, there are numerous design choices to consider. There are a wide variety of options that offer functionality and a pleasing appearance. 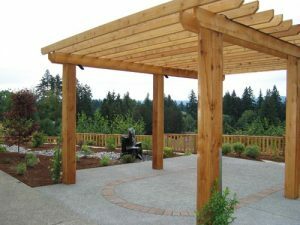 Here are the benefits of the most popular outdoor wood structures. If you have the outdoor space, adding a deck or patio should be a priority. Not only is wood structure construction appealing for outdoor spaces, a high quality deck or patio can significantly increase the value of your property as well. In addition, you will be able to enjoy your outdoor living space year round with an expertly installed patio cover. Below is a quick overview of Boulder Fall’s most popular outdoor wood structure options. Don’t see what you have in mind? No problem. Customer satisfaction is the top priority, so if you can envision it, we want to help make it happen. Once your wood structure is in place and you are able to revel in all its glory, it’s time to plan ahead for its maintenance. Boulder Falls proudly offers wood structure maintenance services so you won’t need to worry about its condition as the weather changes and the wood ages. Periodically, your wood structure will need maintenance by way of painting and/or resealing, depending on the type of wood chosen and the elements it’s exposed to. Leave the maintenance to the experts and protect your investment, you’ll be glad you did! For more information on outdoor wood structures, or to schedule a free no obligation consultation, call Boulder Falls Landscape today!